What is a flexor tendon phlegmon? So what makes a flexor tendon phlegmon so dangerous? What does the term “phlegmone” mean? The correct definition here should be flexor tendon sheath phlegmon. In the case of fingers, the flexor tendons run within a narrow tunnel system. Each flexor tendon is surrounded by a thin membrane. This membrane is referred to as synovial membrane (synovialis) or tendon sheath. If bacteria penetrate deeply into this thin lubricating layer of a flexor tendon, the germs will multiply very quickly. From there the contamination will spread rapidly along the flexor tendon. A very thin lubricating layer – the tendon sheath or synovialis – allows the flexor tendon to smoothly slide through this tunnel. What causes a flexor tendon phlegmon (infectious flexor tenosynovitis)? The trigger for the formation of flexor tendon phlegmons oftentimes can be found in an injury, exposing the adipose tissue and the tendon tunnel. Noteworthy hereby is that not always the flexor tendon itself has to be injured. In fact, many times the external injury is quite minor. The external injury is quite inconspicuous. The redness and swelling along the flexor tendon are early hints for the development of a flexor tendon phlegmon. In most cases the superficial wound forms a scab and heals fairly quickly. The bacteria which had entered the tendon tunnel while exposed can now proliferate and spread completely unhindered. It is good to know that the proliferation of the bacteria may proceed at a very rapid pace and reach far beyond the finger into the carpal tunnel and beyond into the forearm. 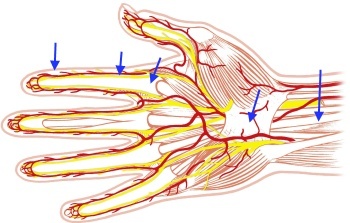 The blue arrows mark the proliferation path seen in connection with flexor tendon phlegmons. The infection may penetrate even into the carpal tunnel all the way into the forearm. The image shows an accumulation of infectious agents. The germs may originate in the skin of the injured person, but may also come from a knife, a piece of broken glass, etc., anything that caused the injury. 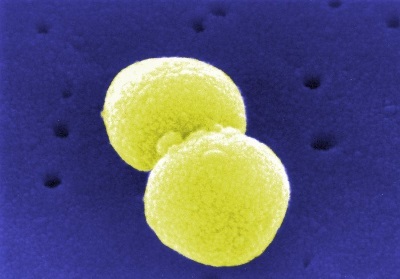 Staphylococci and streptococci are the most common germs found in connection with an infectious flexor tenosynovitis. If the infection was caused by Group A streptococci, the risk of spreading at a fast pace is rather high! An infection caused by Group A streptococci (or closely related pathogens) may under very unfavorable conditions even end fatal!!! A phlegmon is an extensively spreading infection with bacteria. As opposed to an abscess it is a closed space infection (accumulation of pus).